» The next day, after arriving to Fuerteventura, I had my first day of surf…ever, I was so excited! « . I had never tried any form of surfing or water sport that involved anything other than plain swimming. So to be honest I was excited but also a bit nervous. We were greeted by Simone, a jolly italian surf teacher, jumped in the van and went to pick up the rest of the surf students. The teachers check the weather forecasts in advance and decide where to go. This day we headed to El Cotillo, one of the most popular surf spots in the north-west of Fuerteventura. It is a beach-break with sandy bottom and occasional rocks. Absolutely beautiful place! So, the first challenge of the day was squeezing into the wetsuit. Even though it turned out I had a too big wetsuit it is something with the material that just makes you feel like a chorizo. But after a minute you’re already used to the feeling and ready for some warm up on the beach. We did some stretching and warming up of our “surf muscles” that basically are your shoulders and biceps. Then we did some dry-practice of the paddling and standing up; paddle – plank – step with your back foot – step up with your front foot – smile, because there will be a photographer taking pictures of us on the beach! Then the teacher explained to us how the water moves, the characteristics of the sea bottom, and how the currents carry us. After the theory the next challenge was getting in the water and getting out to a spot from where you could actually catch a wave. Carrying our boards we waded outwards and outwards, occasionally getting hit by these crazy huge waves that threw you back ten steps and had such a force that you could feel the water wash through your nose down the throat, but as courageous vikings we continued and fought our way out there time after time to the line-up. And oh my God – it was FUN! Tough as hell in the beginning, arms like spaghetti, legs like led, and the head full of salt water, but the feeling of being there in the sea and in the midst of all its enormous power. Wow! After a few attempts I actually got up to a standing position and suddenly the fatigue just evaporated. 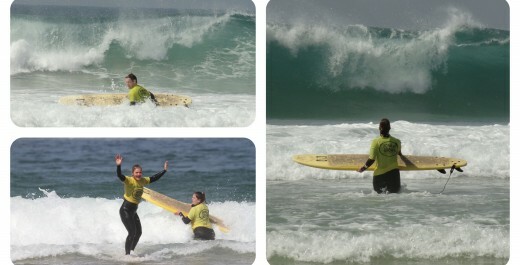 It wasn’t any hip showcase of good looking surf moves, but I felt like such a winner. I got up. Standing. Wohooo! Later it turned out that the waves and the swell this day had been on the bigger side for beginners. Three meters to be exact according to someone who knew… So, we definitely got to start our surfing in some breathtaking conditions. After that first day of surf nothing scared me anymore. I survived. And I had so much fun!